July 14, 2018: After the media walking tour for the Feast of St. Lawrence, we were in search of a restaurant for dinner. 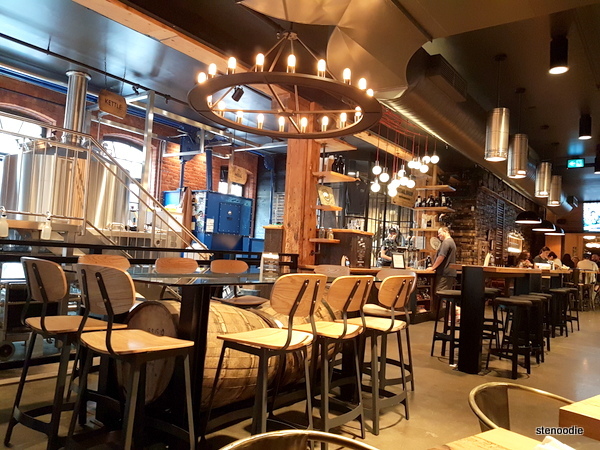 We came across Goose Island Brewhouse which was also in the Old Town Toronto area. 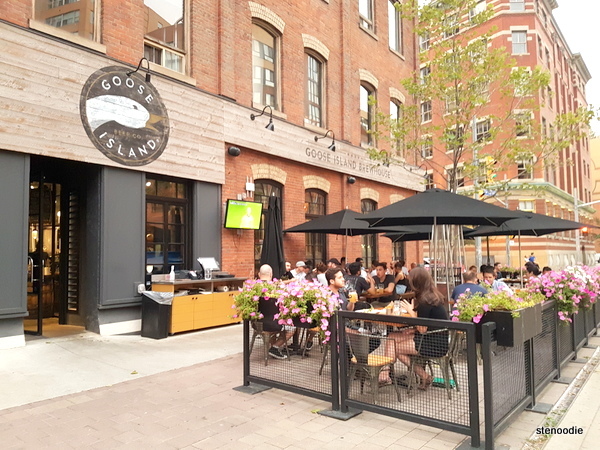 They had a nice patio on this beautiful summer day and we headed inside to take a look at their menu before deciding whether we wanted to dine in or not. Stepping in and glancing through their menu, I also noticed how nice the interior was. I could already spot at least one item I could try on their menu, so we decided to dine here. I definitely liked the cozy interior of the restaurant. There were a lot of brew kettles and tanks and I could see the line of different types of Goose Island beers on tap at the counter. 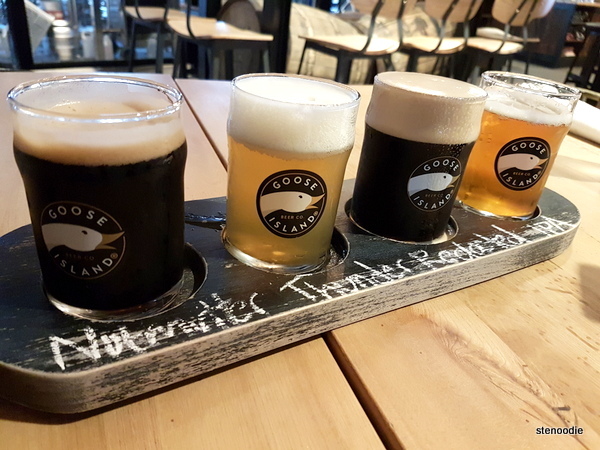 Goose Island beers on tap! I was so impressed with this meal! 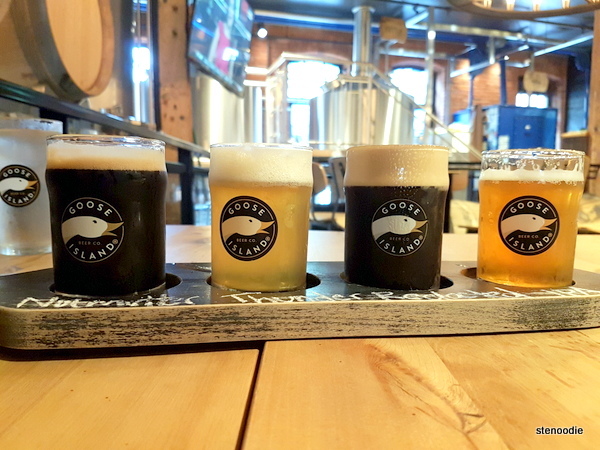 First of all, we had a flight of beer (I love flights). 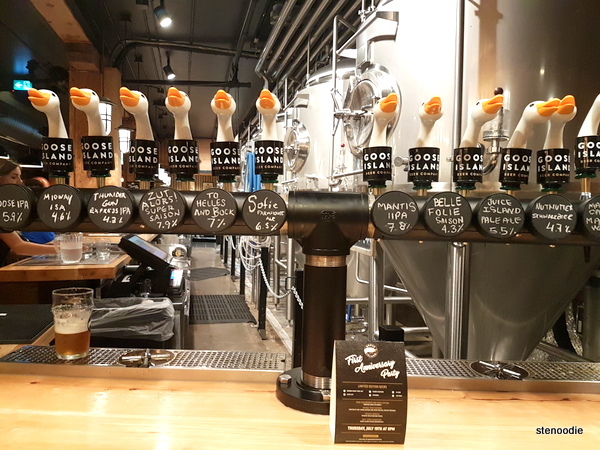 We were able to try the original Goose Island beer plus three other reincarnations! It was so great. 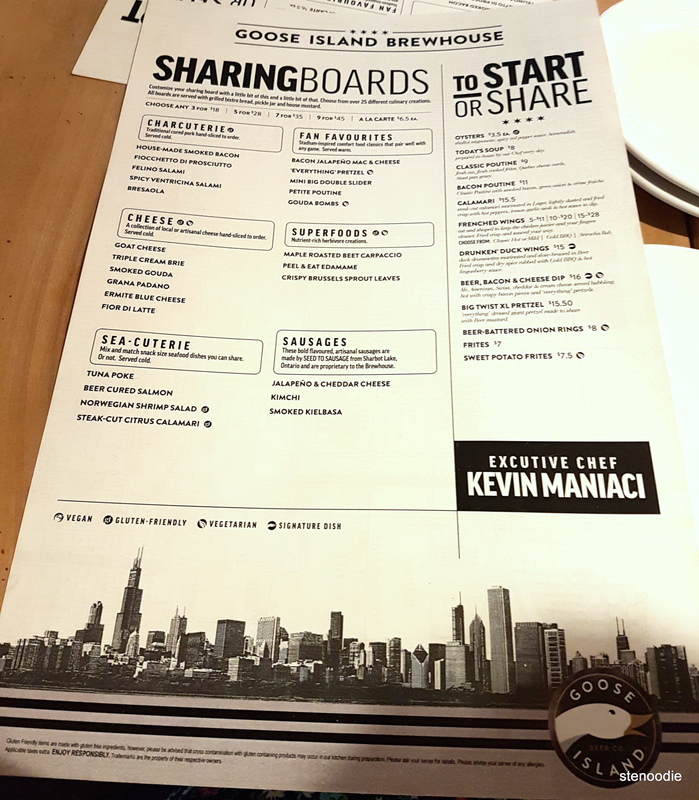 Secondly, they had a sharing board option where you could customize your board with any of their 25 culinary creations! They priced them at three, five, seven, nine on a board, or a la carte. 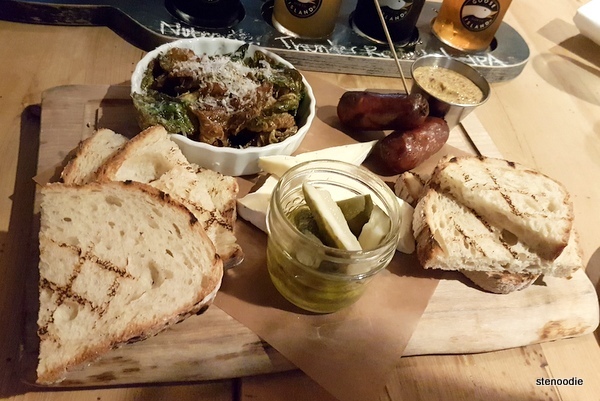 We decided to choose three items to go on our sharing board. 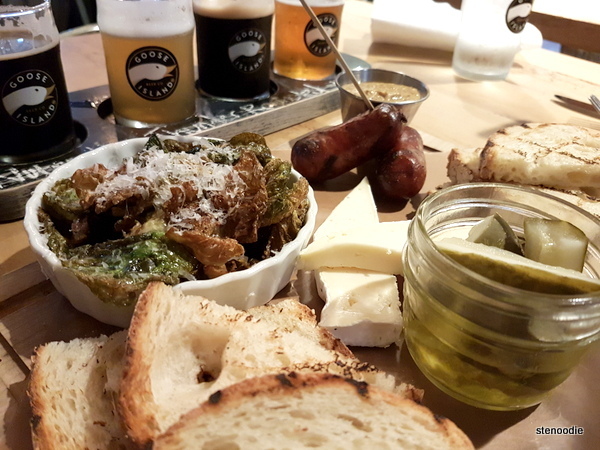 We chose the Crispy Brussels Sprout Leaves, Triple Cream Brie, and the Smoked Kielbasa sausage. Our three choices were fantastic. The Crispy Brussels Sprout Leaves were really good with lots of parmesan cheese on it. The Triple Cream Brie was great as well as the Smoked Kielbasa sausage. The bread that came with the sharing board was so good too! There was also a small tub of pickles. I ordered the Pig Roast Sandwich. 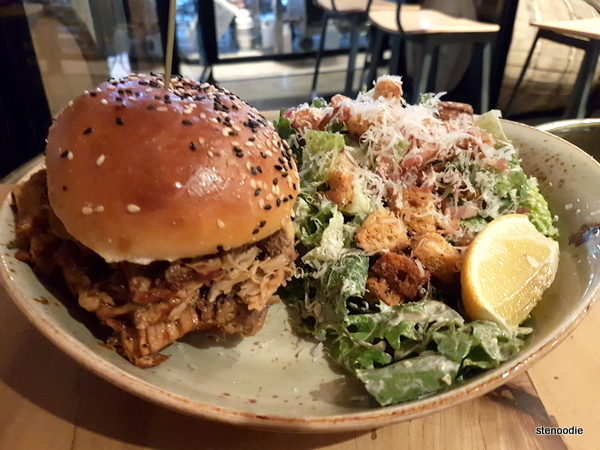 Its description sucked me in and I was very curious about a “brined and basted whole roasted suckling pig, crackling, seasonal fruit slaw, jalapeno and dijonnaise on a toasted black and white sesame seed bun”. When it arrived, I was so impressed with its size! The portion was huge! At first, I actually thought that the wrong order was given to us because I didn’t think that the “crackling” part was present. However, after I asked the server about this, she took the order back to ask the kitchen about it and reassured us that it was the correct order. I liked the sandwich regardless. There was actually so much roasted pork in between the buns. It was a very impressive portion. 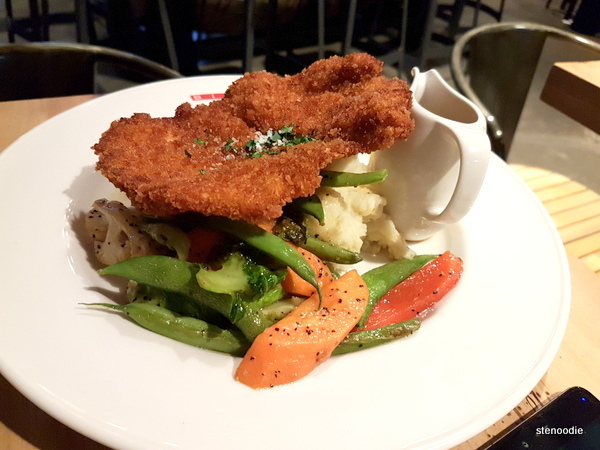 Ken ordered the Chicken Schnitzel which was served with Yukon gold mashed and mixed vegetables with mushroom, tomato, and onion gravy. It was also a really nicely plated dish. In fact, Goose Island seems to share its dining space and menu with Bier Market as the plate that this dish arrived on had the Bier Market logo on it. 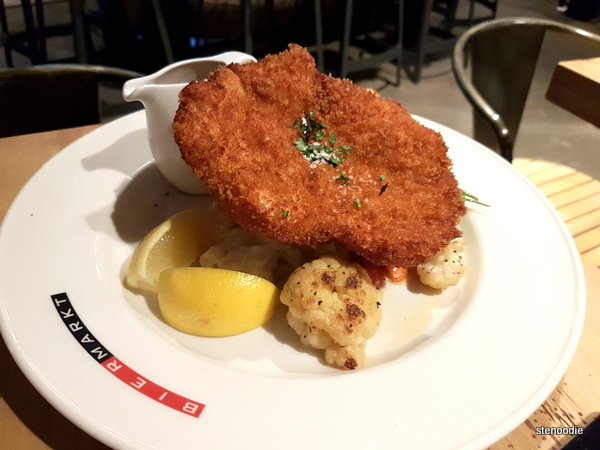 This Chicken Schnitzel was also very impressive as the chicken cutlet was nicely crispy on the outside but not dry at all! It was really good! I also liked the fresh and moist vegetables that came with it. As you can tell, we had a really good time dining here. 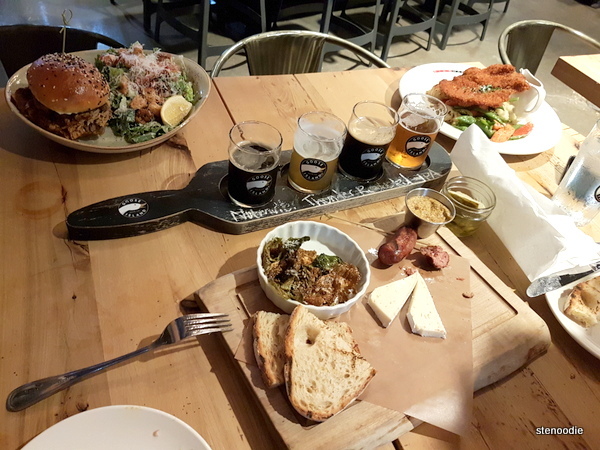 The food choices were exceptional — that sharing board is genius — the portions were phenomenal and the tastes were good, the service was splendid, and the vibe of the restaurant was so nice to chill in for some beers. 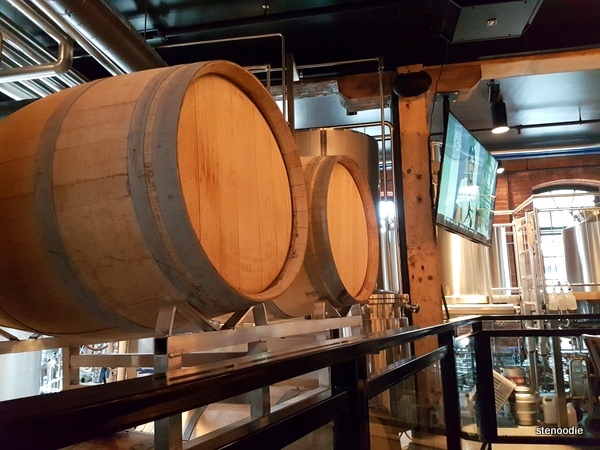 I would totally return to the Goose Island Brewhouse for another meal! This entry was posted in Food and tagged 70 The Esplanade, @GooseIsland twitter, @OldTownToronto twitter, Chicken Schnitzel, Crispy Brussels Sprout Leaves, food blogger, foodie, Goose Island beer flights, Goose Island beers on tap, Goose Island Brewhouse customizable sharing board, Goose Island Brewhouse food reviews, Goose Island Brewhouse sharing board menu and prices, Goose Island Brewhouse Toronto, Goose Island Brewhouse Toronto beer flights, Old Town Toronto restaurants, Pig Roast Sandwich, restaurant review, Smoked Kielbasa sausage, Toronto, Toronto brewhouses, Toronto food bloggers, Triple Cream Brie. Bookmark the permalink.